Thanksgiving has come and gone, and we're only three weeks away from Christmas. I hope you all had a blessed day filled with love and family. Did you remember to relax and breathe when dealing with the day? Did you do okay with the food situation? Or did you resign yourself to the day and show up in your sweat pants with the elastic waistband?? The good news is: that was only ONE day out of 365. So if you happened to indulge a little more than you should have...okay a LOT more than you should have.. it's okay. Today is a new day and a chance to start fresh. Don't do what I used to do: Mentally, Monday is always the first day of the week, right? So my best intentions used to always be saved for Monday. The new diet would start at the first of the week. By Wednesday, it had gone by the wayside....and then of course, Wednesday is almost the weekend, and everyone knows you can't start a diet on the weekend...and you know, Monday was right around the corner, and that's the day to start. So essentially, dieting 2 days a week, and getting ready to diet for the other five. I can laugh at it now...but thinking about that way of thinking....madness. Can you relate? I know you know what I'm talking about! My Thanksgiving day was wonderful. I've been sharing my gratitude list with you for a couple of weeks now. If you're just here for the first time, I've been writing down 5 things a day that I am grateful for. I continued it up to Thanksgiving and I'm still doing it now, almost a week afterward, because it is such a great exercise in raising my consciousness about all that I have. By the time Thanksgiving day rolled around on Thursday, I was so emotional about all that I had been blessed with. I heart felt so "open" and I just had the best day. Throughout the day I was reminded of these blessings and it just added to my wonderful day. Now that Thanksgiving has come and gone, I am still in tune to the blessings. I'm still doing my five a day! So what are today's five? 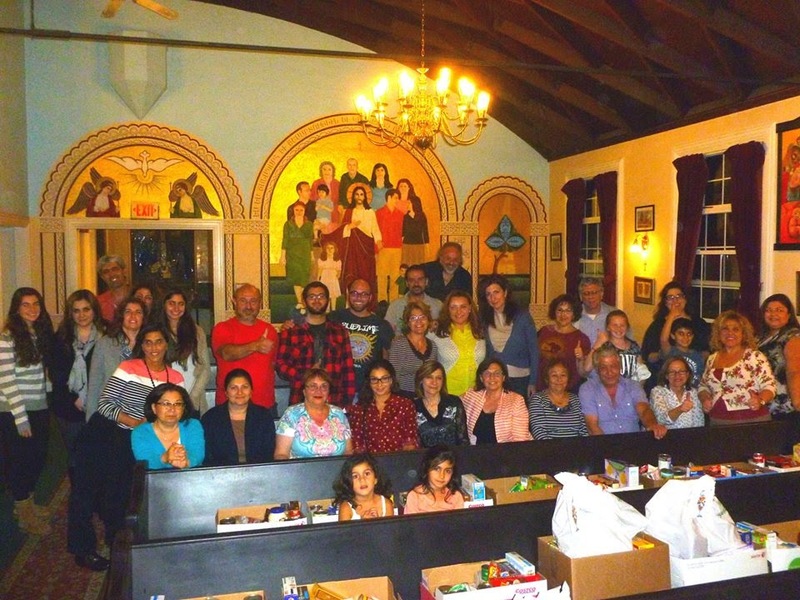 As wonderful as Thanksgiving Day was, the holiday really started off on Thanksgiving eve when we got together to distribute the food collected during our annual In His Shoes food drive. If you listened to this week's Next Step with Father Vazken, he shared with us about the evening, the service, the people. What I wanted to share with you today is about the three families that we personally delivered food boxes and turkeys to. When I say "we" I mean my husband Neddy, my 11 year old niece Nicole, and I. 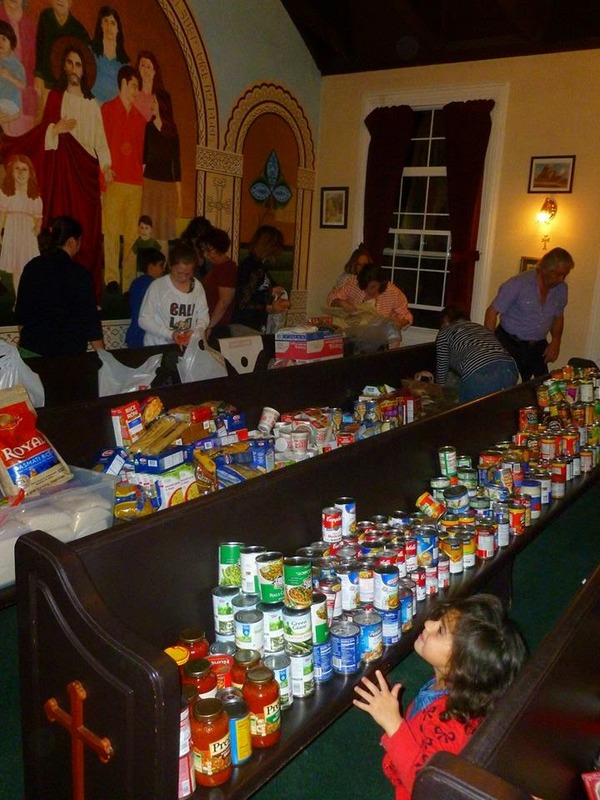 Our In His Shoes ministry was able to provide food for about 40 families. And I was really moved because this year, I was able to get the names of three families that had just been placed in housing after living in the shelter. Because of our work with Glendale's homeless shelter, the case worker there was able to connect us with these three families for food drop off after our Thanksgiving eve service. Along with giving you a glimpse at these three families, I also wanted to discuss the importance of involving our children (nieces, nephews, grandchildren) in Christian outreach. My sister was busy with my older niece that evening, so I asked if Nicole would like to come with me. At 11 years old, Nicole is really a good worker, and when I told her we'd be sorting and boxing food for needy families, she was happy to come. It's important for kids to feel a part of something greater than instagram, facebook, texts and selfies, right? And given that this was all happening at our church, my she was very comfortable with just jumping in and helping because she was with her extended church family. We arrived at church at 6:00 p.m., and it was already this bustling beehive of activity. The most wonderful thing, I think, is that our volunteers were all ages We had families and children working side by side with parents and grandparents. Nicole started bagging fresh potatos, carrots and yams. I was sorting cans. 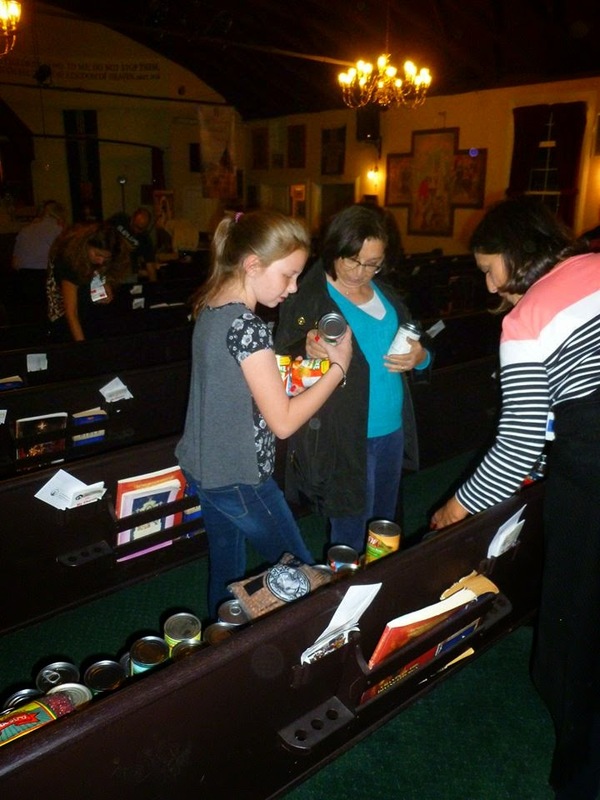 Everyone was in a great mood, and like a well-oiled machine, sorting through the donations we received and the putting them in corresponding pews. If you can imagine, all the various types of canned and dried foods were in their own spots, making a balanced distribution easier. And the potatoes, carrots and yams were being bagged for each family as well. When the sorting was done, we all started filling the boxes. Each family would receive a full box of dry and canned foods, cereal, fruits and vegetables, mashed potatoes, pasta and rice, fresh vegetables and a fresh turkey. After a very beautiful and meaningful service of Thanksgiving, the food was blessed and some of us had deliveries to make. I had received the names of three families in transitional housing from their caseworker at the shelter. We had the routes mapped out and finally found the first aparment where we met Gary. Gary was a single father with a 9 year old and an 8 month baby. I had called the three families earlier in the day to let them know we'd be coming over at night after church, so he was expecting us. The door was open. He invited us in . The apartment was like one large room. Very little furniture, and unpacked boxes. His eyes were filled with emotion as he thanked us and told us how this blessing had come at the perfect time. I asked if he knew how to cook a turkey telling him to make sure that refrigerate it overnight. He said he would ask one of the others in the building to help. Coincidentally, my boss had given me a bag of baby food just the other day hoping I might find a family that could use it. And seeing that Gary had an 8 month old, his little baby was the recipient. I'm always amazed at how God puts right where we are needed most. Receiving the food, he was just so happy, and a look of relief came over his face. We hugged, he blessed us, and when we left, he was smiling. Our second delivery was to a small apartment a few miles away. Maria opened the door and invited us in to bring in the boxes and bags of food. The apartment was small and cluttered. The dishes weren't done, there was unfinished homework on the table. Two young children came running into the living room and hid behind Maria's legs, screaming and playing. They saw Nicole and squealed and ran off. Maria yelled at them to behave themselves. She said, "my granddaughter has special needs." She explained that she was living in this apartment with 4 of her grandchildren and how grateful she was for the food. Here's another example of "right place/right time": Nicole had no idea who we were delivering food to, but she had brought with her a brand new purple sweater with the idea that we might find someone she could give it to. She whispered to me if we should give her sweater to this little girl. We showed the sweater to the Maria telling her it was from Nicole....and asked if her granddaughter would be able to use it. She was grateful and said that purple was her granddaugher's favorite color. As we were leaving, the little girl was calling out after my niece. "What's your name??? Nicole turned around to answer her and saw that she was holding the bottle of apple juice that we had put in the box. "Thank you for my juice! It's my favorite kind." The last delivery we made was to Kim. She and her husband lived in this small apartment with almost no furniture at all. In the kitchen a TV tray served as a table for two. There was a stool and a chair and that was about it. When we came in with the food, Kim and her husband praised God. They thanked us and blessed us. Kim couldn't contain her happiness and came over and hugged all three of us, thanking us and giving thanks to God at the same time. Her sincerity and faith was really touching. She was excited about the prospect of being able to roast a turkey...something she hadn't been able to do for a while. We wished them a Happy Thanksgiving and were on our way. On our way home, I was interested my my niece's reaction to what she had just witnessed. What had surprised her the most was the lack of furniture in the last home.....and living out of boxes in Gary's home. It was good for her to see because I think our children and grandchildren are desensitized to what's going on in our country...our community. It's good for them to see beyond their bubble. She was surprised to see Gary's apartment with no room for much of anything...and there were 3 people living there. She asked how they could do it? I explained to her that whe you put it into perspective - that just a week or so ago they were living in a shelter, and prior to that on the street with no home at all - this little apartment is a wonderful and safe home and definitely a blessing. 2. You don't have to be a certain age to do God's work. It's right there when you open your heart to it. All you have to do is care. 3. A simple act of kindness brings about other acts of kindness...it just kind of snowballs. We delivered the food, they gave us hugs, we hugged back, they got to eat, we got to feel good....it's a win/win! 4. A cell phone isn't everything. When I first picked up my niece, all the way to church she was on her cell phone, texting, posting, etc. Once we got to church, I told her "put it away." It took a few times of me saying it but she did. It was only after putting it away that she started enjoying herself, working with the others for a common goal. I think kids lose site of this. There's so much to be done. We just have to harness that energy.